Thirteen parts in fifteen volumes (38.5 cm), complete. I. Xylographica and books printed with types at Mainz, Strassburg, Bamberg and Cologne (originally published 1908). xxviii, 312, 12 pp. and plates 1-29 (parts I-III paged continuously). II. Germany: Eltvil - Trier (originally published 1912). xvii, 313-620, 13-22 pp. and plates 30-59 (parts I-III paged continuously). III. Germany: Leipzig - Pforzheim. German-speaking Switzerland and Austria-Hungary (originally published 1913). xl, 621-864, 23-30 pp. and plates 60-78 (parts I-III paged continuously). IV: Italy: Subiaco and Rome (originally published 1916). 16, xvi, 145, 10 pp. and plates 1-13 (parts IV-VII paged continuously). V: Italy: Venice (originally published 1924). liv, 147-598, 11-26 pp. and plates 14-41 (parts IV-VII paged continuously). VI: Italy: Foligno, Ferrara, Florence, Milan, Bologna, Naples, Perugia and Treviso (originally published 1930). l, 599-899, 27-37 pp. and plates 42-72 (parts IV-VII paged continuously). VII: Italy: Genoa. Unassigned. Addenda (originally published 1935). lxxxviii, 901-1213, 37-50 pp. and plates 73-109 (parts IV-VII paged continuously). VIII: France. French-speaking Switzerland (originally published 1949). lxxxvii, 441, 21 pp. and 72 plates. IX: Holland. Belgium (originally published 1962). 308 pp. (various pagings). X: Spain. Portugal (1971). lxxv, 92, (2), 6 pp. 20 plates. XI: England (2007). x, 507 pp. XII: Italy. Supplement (1985). x, 93 pp., 8 plates. XIII. Hebraica (2004). lxxi, 288 pp. 50 leaves with facsimiles and other illustrations. [XIV]: Facsimiles, Parts I-III. Illustrating types used in Germany, German-speaking Switzerland and Austria-Hungary (originally published 1913). 30 pp. [XV]: Facsimiles, Parts IV-VII (originally published 1916). 50 pp. Uniform publisher’s printed boards (vols. I-X, XIV-XV), publisher’s cloth (XI-XIII). 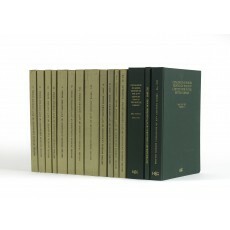 Complete set, providing descriptions of some 10,500 editions. “Every profession, it seems, possesses one supreme work of reference… unequalled by any other work in the same field. For incunabulists (indeed, for all bibliographers), there is the British Museum’s catalogue of incunabula” (from a review by Curt F. Bühler of volume IX, in The Book Collector, Winter 1962, p.489). 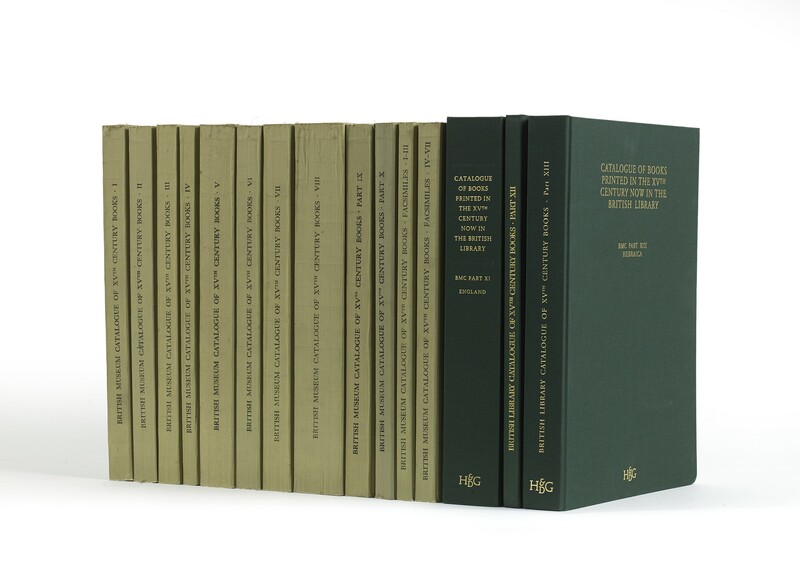 “Perhaps no other collection of any type of book has had a catalogue that has become such a standard work in its field, used as much as an authoritative bibliography as a record of holdings (from a review by Martin Davies of volume XI in The Book Collector, Summer 2007, p.191). Parts I-VIII (10 volumes) are in the lithographic reprint issued in 1963; the remaining volumes in original editions. Vols. XI and XIII only are in print, each €1041 (www.brill.com; link). ¶ In fine state of preservation, virtually as new. (39 cm), xxviii, 312, 12 pp., plates 1-29 (parts I-III are paged continuously). Publisher’s printed boards. - Lithographic reprint of the Museum’s working copy, with manuscript additions and corrections by members of the staff (originally published 1908). “The manuscript notes are naturally most numerous in the early parts. The sections of Part I on block-books and Mainz printing contain (apart from minor corrections) about three notes per page. One-third bring refinements to the description of the Museum copy, a further quarter relate to the collation of the edition; and in 47 pages there are 26 references to relevant publications” (from a review by W. Beattie and L.G. Heywood, in The Book Collector, Winter 1963, pp.499-504). (39 cm), xvii, pp.313-620, pp.13-22, plates 30-59 (parts I-III are paged continuously). Publisher’s printed boards. - Originally published 1912. (39 cm), xl, pp.621-864, pp.23-30, plates 60-78 (parts I-III are paged continuously). - Originally published 1913. (39 cm), xvi, 145, 10 pp. and plates 1-13 (parts IV-VII are paged continuously). Publisher’s printed boards. - Originally published 1916. (39 cm), liv, pp.147-598, pp.11-26, plates 14-41 (parts IV-VII are paged continuously). Publisher’s printed boards. - Originally published 1924. (39 cm), (2), pp.599-899, pp.27-37, plates 42-72 (parts IV-VII are paged continuously). Publisher’s printed boards. - Originally published 1930. (39 cm), lxxxviii, pp.901-1213, pp.37-50, plates 73-109 (parts IV-VII paged continuously). Publisher’s printed boards. - Originally published 1935. (39 cm), lxxxvii, 441, 21 pp., 72 plates. Publisher’s printed boards. - Originally published 1949. (39 cm), 308 pp. (various pagings). Publisher’s printed boards. - Seen through the press by George D. Painter (1914-2005). Lithographic reprint of the 1962 edition. Cf. D.E. Rhodes, “Bibliography of Leslie A. Sheppard (1890-1985)” in The Bodleian Library Record, volume 12 (1987), pp.400-402. (39 cm), lxxv, 92, (2), 6 pp., 20 plates. Publisher’s printed boards. - Original edition. Seen through the press by George D. Painter (1914-2005). (39 cm), x, 507 pp. Publisher’s cloth. - “All future work on English incunabula will have to use this catalogue as its ground and point of departure. It is a triumph of learning and observation, and it brings the stately series of BMC to a close in a manner which is never likely to be repeated in any comparable catalogue” (Martin Davies). With contributions by Margaret A.E. Nickson and Paul Needham. Original edition; publisher’s retail price €1041 (www.brill.com). Reviewed by A.S.G. Edwards, “Incunabula in England” and Martin Davies, “BMC XI” in The Book Collector, Summer 2007, pp.179-189 and pp.191-199 (p.199). (39 cm), x, 93 pp., 8 plates. Publisher’s cloth. - Original edition. (39 cm), lxxi, 288 pp., 50 leaves with facsimiles and other illustrations. Publisher’s cloth. - Original edition. Publisher’s retail price €1041 (www.brill.com). (39 cm), 30 pp. Publisher’s printed boards. - Originally published 1913. (39 cm), 50 pp. Publisher’s printed boards. - Originally published 1916.